Will a Fed rate hike affect house prices in emerging markets? In some parts of the emerging world, housing markets have grown well ahead of income in recent years. Will a US monetary policy normalisation bring about a correction in house prices as the search for yield unwinds and capital flows back to the US? Looking at the past through the prism of a structural VAR, we think the answer is “yes it will”. 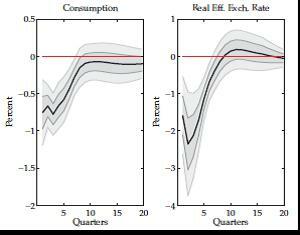 Shocks to global liquidity have much larger effects on house prices in emerging markets than in advanced world economies. 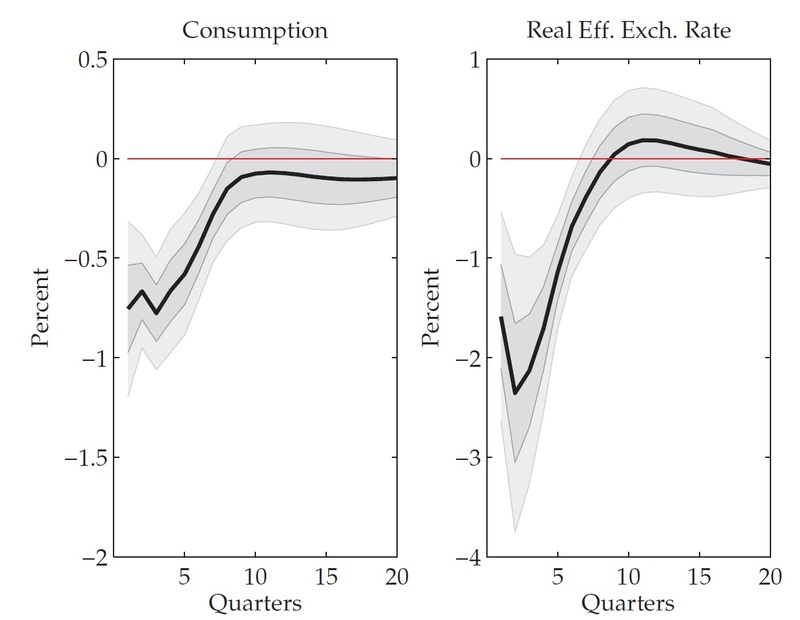 A tightening in global liquidity conditions also leads to a rapid capital account reversal, exchange rate depreciation and hence a sharp fall in consumption. Since the 2008-09 global financial crisis, which saw a steep and highly synchronized decline in valuations, housing markets around the world have cruised at different speeds. 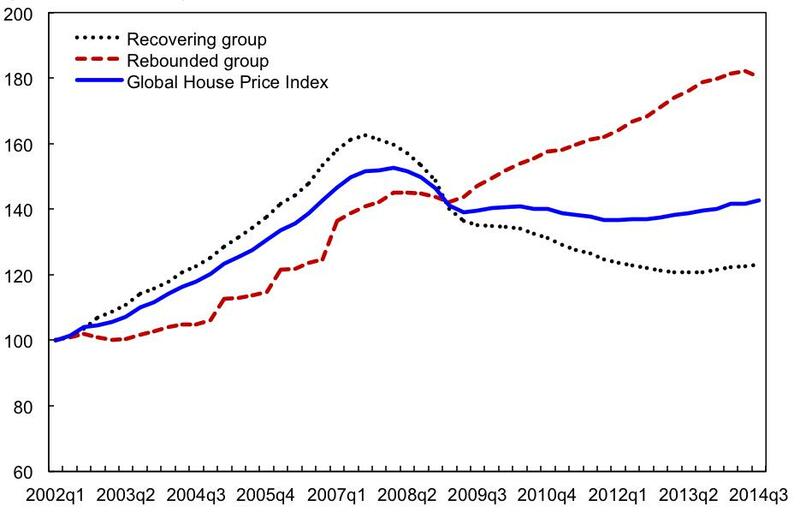 While in most advanced economies, house prices contracted for a prolonged period both during and after the crisis, in emerging markets, house prices suffered brief declines, recovered quickly and have kept rising since (Figure 1). 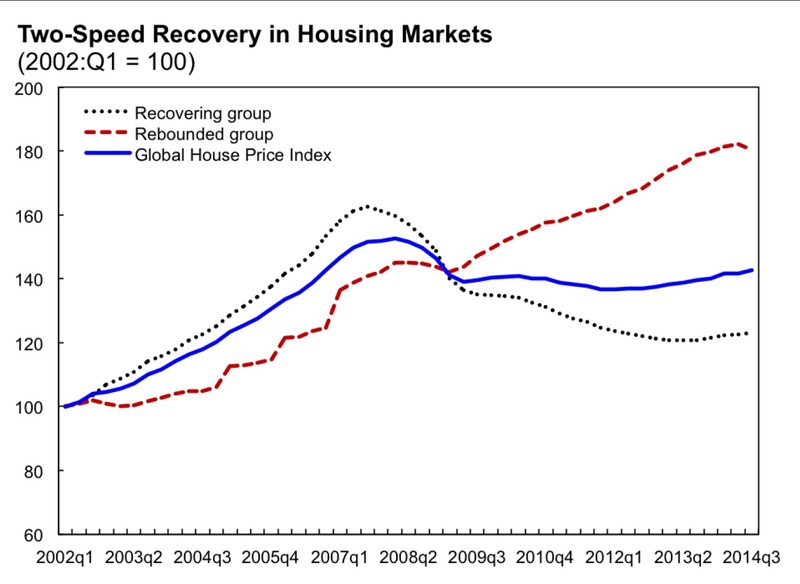 Source: Global Housing Watch: Quarterly Update (April 2015). The Fed has now signalled it intends to raise interest rates soon, for the first time since December 2008 when it cut the federal funds rate to zero to fight the global financial crisis. The U.S. economy is now approaching full capacity, with rising real wages and headline inflation kept in check by low energy prices. The S&P 500 continues to reach new all-time highs while credit growth resumed — all healthy signs of a rehabilitated economy capable of standing on its feet. A contractionary shock to US monetary policy usually leads to a decrease in cross-border banking capital flows and a decline in the leverage of international banks. Rey (2013) and Bruno and Shin (2014), for instance, find that when the Fed tightens gross cross-border banking credit tends to fall, global banks’ leverage decrease and the U.S. dollar appreciates. This, in turn, can potentially cause distress at the periphery of the global financial system. 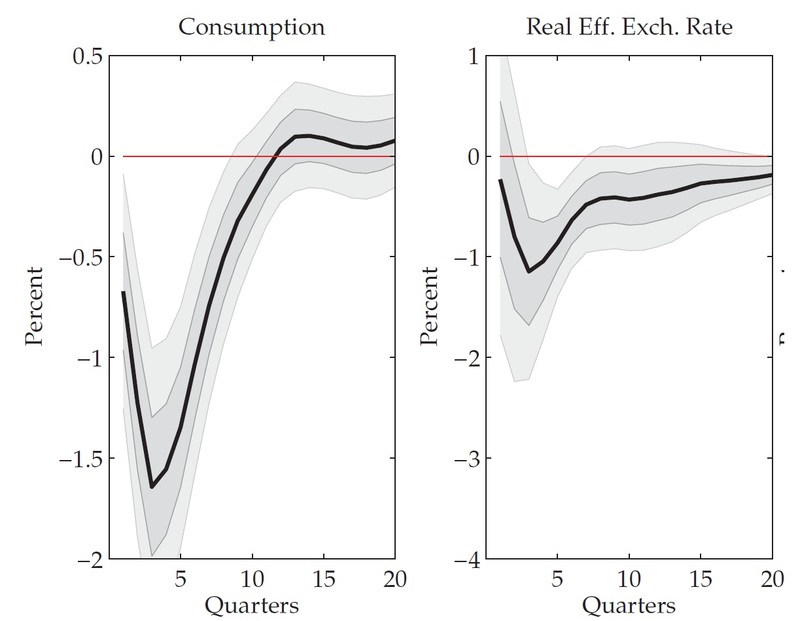 In a recent paper (Cesa-Bianchi, Cespedes, and Rebucci, 2015), we find that house prices in emerging markets are much more sensitive to swings in cross-border capital than in advanced economies. Notes: Impulse responses to a global liquidity shock that generates a fall in cross-border credit of about 10 percent of cross border credit outstanding. The dark and light shaded areas are the one- and two-standard-deviation confidence intervals. Source: Cesa-Bianchi, Cespedes, and Rebucci (2015). Click images to enlarge. Specifically, we consider an exogenous change to a particular component of capital flows: global liquidity, broadly understood as a proxy for the international supply of credit. 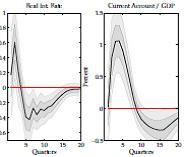 Our estimates imply that a fall in cross-border credit of about 10 percent of total cross border credit outstanding makes house prices drop by a little less than one percent in advanced economies, but more than three percent in emerging markets (Figure 2). 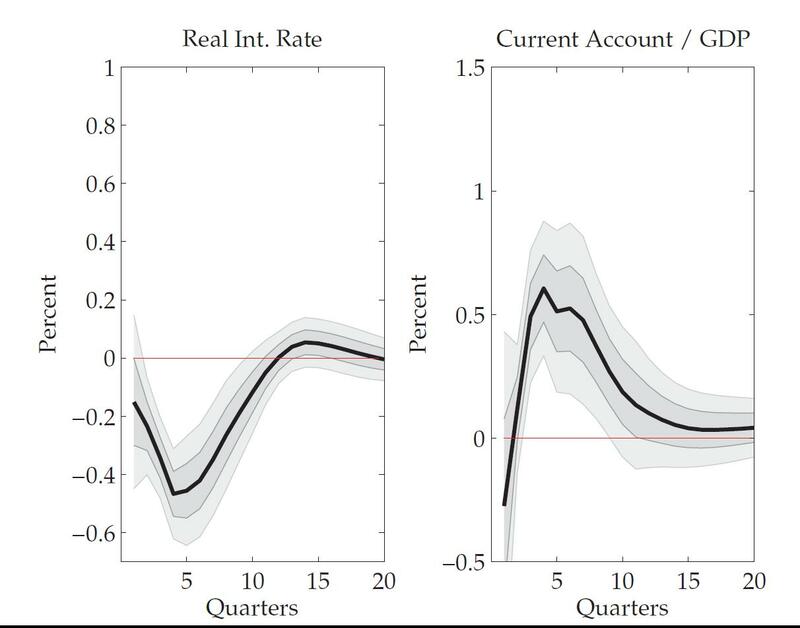 According to our estimates, when capital flows out of these economies and house prices tumble, the exchange rate also depreciates, the current account balance suddenly swings into surplus, and consumption has to adjust (Figure 3). Notes: Impulse responses to a global liquidity shock that generates a fall in cross-border credit of about 10 percent of cross border credit outstanding. The dark and light shaded areas are the one- and two-standard-deviation confidence intervals. Source: Cesa-Bianchi, Cespedes, and Rebucci (2015). Unfortunately, these dynamics are very familiar in emerging markets. For example, the ignominious series of financial crises that started with the 1994 Tequila crisis in Mexico, marked the end of a 10-year long house price boom in emerging markets comparable to the one enjoyed by advanced economies in the 2000s (Figure 4). 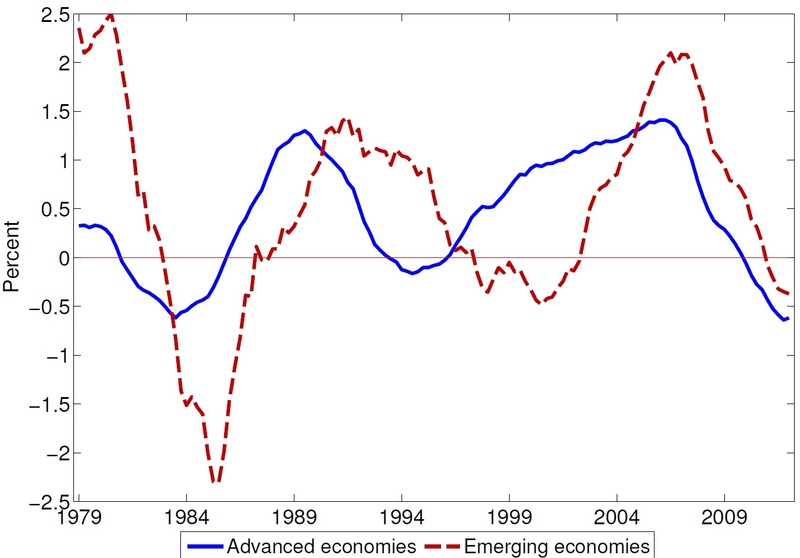 While housing markets in advanced economies had cooled down in the early 1990s, in emerging markets they kept roaring ahead until mid-1990s, propelled by loose monetary conditions at the centre and easy access to international credit. Eventually, when they crashed, it took more than 10 years to recover. Notes: cross-country 5-year moving averages of the quarter-on-quarter growth rate of real house prices in advanced and emerging economies. Sources: Authors’ calculations based on data from Cesa-Bianchi, Ferrero, and Rebucci (2015). Click images to enlarge. So, what can we learn from these past experiences? Once the capital flow shock has hit, loosening domestic monetary conditions and a depreciating exchange rate can help cushion the blow, but clearly this is not enough. The reason is that –when domestic capital markets are disrupted by the capital outflow– lowering interest rates is ineffective: intermediaries will not lend no matter what if the economy is under stress. So lowering the policy rate will not help. Exchange rate depreciations can in principle help export more. But, if borrowing is in foreign currency, debt burden soar making it much harder or impossible to repay. With a limited scope for trying to rescue an economy after a crash, the best course of policy action is to try to engineer an orderly housing correction before it is too late. Tightening the regulatory parameters of the housing and housing finance system in a precautionary manner –i.e., the so-called macro-prudential policies– is one approach. This would not only cool off housing and credit markets, but would also put them on more solid footing to face the financial distress that we may be observing in the near future. Indeed, some countries did precisely so. Many others, however, have enjoyed their housing party to the very end. Let’s just hope this time around the hangover will not be as bad as after 1994. Ambrogio Cesa-Bianchi works in the Bank’s Global Spillovers and Interconnections Division, Alessandro Rebucci works at the Carey Business School at Johns Hopkins University. 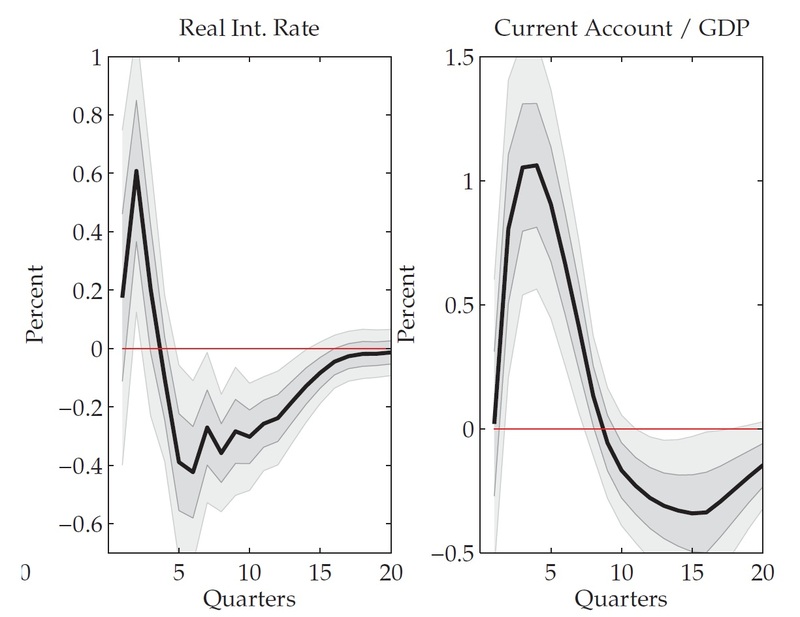 Next Post Did Quantitative Easing boost bank lending?